If you’re an aspiring entrepreneur or someone hoping to break into the world of business, you’re going to have a lot of questions. You can go to school for four years and pick the brains of your professors and spend all night doing homework in the library, but you’re still going to have questions. This is true with any profession, and most will tell you that finding the answers to these questions aren’t always easy. It’s intimidating to ask your boss a question that you may think should be obvious, and Google doesn’t always do the trick. Fortunately, Quora is beginning to take the world of questions by storm. • Google: This works well when you want to know the answer to a simple question, but nothing too specific. If you’re having a complex problem and want an answer, Google may give you something complex – and entirely different from what you’re looking for. • Wikipedia: Anyone can add information to a Wikipedia page, and in most cases you have no idea where the information came from. With Quora, you know exactly who gave the answer to your question. Former CTO of Facebook, Adam D’Angelo, created Quora back in 2009. This helped the site gain popularity quickly and helped draw some of the top professionals in every industry to take notice. 1. Profile: If you want to answer a question on Quora, you must have a profile. This helps show who exactly is giving a specific answer; thus helping users determine whether the source of the answer is reliable – or not. 2. Voting: Users can vote answers that they find most relevant or most correct. This allows the best answer to always remain at the top. 3. Revision: The site gives anyone the ability to make slight revisions to a question. These revisions are all tracked so you can see who made the revision. In the end, this helps keeps questions clear and easy to understand. 4. Related: The site is not filled with a bunch of similar questions. Questions that have already been asked will pop up when you type in a question, so that you know what has already been discussed. It also works as a way to point you in the right direction of the answer to your question. 5. Following: You can follow people and/or questions to help you stay in the loop. This helps make the site seem smaller and helps to target exactly what you’re looking to find. 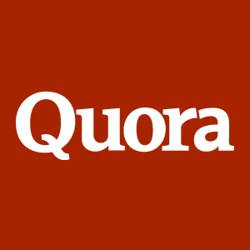 Companies use Quora as a social media marketing / online reputation management tool to increase their visibility and build their brand. By answering questions, you can show potential customers or clients that you are an expert in your field. The more questions you answer, the better you will look in the eyes of users. The site is also a great place to connect with others in the industry or future customers. By creating a great profile page you can show what you know and give users a way to find you and connect you to those brilliant answers. Wow! Another social networking site has been introduced. I’m not familiar with this. I find this interesting because the purpose of this is different from other sites. I feel like Quora has a lot of information. From now on, I will use this site whenever I look for answers. For something that has been around for more than a year, I have to say I haven’t heard much of this “Answer-finding” social networking site. True, there are times when an online user just needs to search for an answer with regards to something and ends up getting more confused with what Google or Wikipedia gives… Quora might be worth a shot!